Please welcome the new price on Octoplus Box - 289$ only, plus free shipping worldwide! Have you heard about new season of astonishing deals from GsmServer Team? We have a special offer for you! You probably already knew that you could buy Octoplus Box, the groundbreaking phone servicing solution, which combines Unibox and JTAG interfaces, for less than 328$?! This old price is a history now. Please welcome the new price - 289$, plus we will deliver the Octoplus Box to you anywhere in the world absolutely free of charge! Hurry up! Sale period will not last long! You can accept this proposition until 01 of November 2015. Therefore, do not miss the chance. 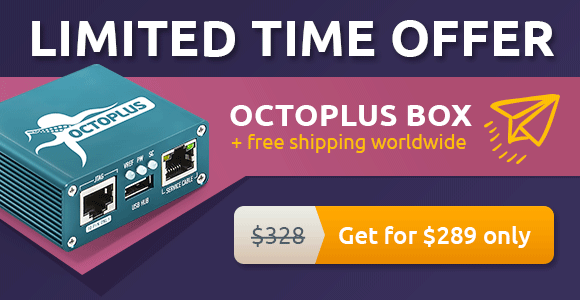 BUY OCTOPLUS BOX RIGHT NOW!